In the 1970's Robert and Julia Mackintosh moved from the island of Grenada in the West Indies to Aiken, South Carolina where they began to propagate little-known and underused native plants. Bob McCartney at Colonial Williamsburg Foundation in Williamsburg, Virginia had been collecting, propagating and introducing into the extensive gardens and grounds a wide range of seldom cultivated species. In the summer of 1980 Bob joined the Mackintoshes as a partner in the new nursery which became incorporated as Woodlanders, Inc. During the 1980's and 90's Woodlanders grew steadily into an internationally known source for more than 1000 kinds of rare and hard-to-find plants. In this article, Bob writes about the hardier species of citrus home growers can add to their grounds and indoor gardens. Did you have your orange juice or grapefruit this morning? Maybe you enjoyed some lemon or lime? Chances are you had citrus or at least something citrus flavored today. Almost all citrus trees are native to eastern Asia, however to most gardeners citrus is something that grows in Florida, California, Arizona, or maybe Texas. While this is true of most citrus in our stores, we are now getting much of our orange juice from Brazil. We are even getting fresh fruit like the ‘Clementine’ tangerines from Spain. Although the U.S. still produces a lot of citrus, freezes, diseases, and development have had a heavy adverse impact on our commercial citrus growing regions. Citrus are basically subtropical plants but many gardeners are unaware that many kinds exist and that some are relatively cold hardy. The Lime is probably the most cold sensitive and the Trifoliate Orange is the most cold-hardy species. The latter was long considered a citrus relative; Poncirus trifoliata. Today the Trifoliate Orange is often considered a true citrus and classified as Citrus trifoliata. This wickedly thorny deciduous shrub or small tree is hardy outdoors as far north as New York! A dwarf form with twisted stems and spines is called ‘Flying Dragon’. While much used as rootstock on which to graft other citrus, it is more a curiosity in the landscape. Trifoliate Orange does have fragrant white flowers followed by showy but inedible orange fruits slightly larger than a golf ball. Though not edible, the fruit is quite aromatic and will nicely perfume a dresser drawer. .
Certain citrus, especially Mandarin Oranges or Satsumas, are again growing commercially in Alabama, and South Carolina where they were once an important crop. 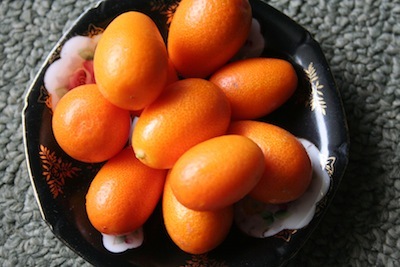 Louisiana has long grown excellent Naval Oranges near the mouth of the Mississippi River but the area suitable for their culture is very limited and most are marketed locally. 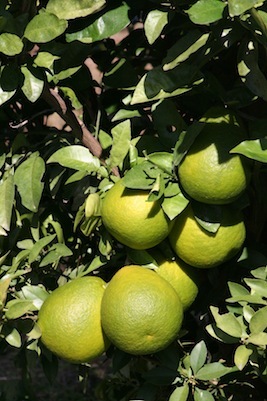 In the less mild regions, including much of the Deep South, winter protection is needed for the commercial types of citrus. Many less familiar kinds of citrus however can be grown as “dooryard” trees throughout the South, even up to North Carolina and Tennessee. At the 2012 Citrus Expo in Myrtle Beach, South Carolina the fruit exhibited included Oranges, Grapefruits, Mandarin Oranges, Sour Oranges, Kumquats, and many kinds of hybrid citrus. More than 20 types exhibited at the Expo were grown outdoors in Augusta, Georgia and neighboring Aiken, South Carolina. Many of the more cold-hardy citrus have sour fruit but these can be used like lemons and limes for ade drinks: pies, marmalades, etc. Some of the most cold-hardy citrus are the Trifoliate Orange hybrids. Some people have stated that these “approach edibility” but they can likewise be used as noted above. In addition, they can be very attractive ornamentals in flower and in fruit. Greenhouse “Orangery’s,” where oranges could be grown under glass were once popular on large estates in Europe and America. Today many ordinary folks in climates too cold for outdoor culture of citrus grow them in containers and give them protection in a greenhouse, sunroom, or even a garage during the cold months. Certain smaller growing types including Calamondin, Sunquat, and Kumquat are best suited to use this way. 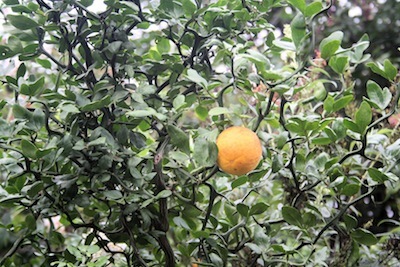 For those gardeners who are willing to go to a little extra trouble to choose the best site conditions and meet the cultural requirements of the plant, the challenge of growing your own citrus can be rewarding. Citrus planted outdoors should have a sandy, well-drained soil in a sunny location. In areas where they are borderline hardy they benefit from a hillside location where cold air drains off and shelter provided by buildings or dense evergreens from the cold northwest winds. Some gardeners in borderline areas protect dooryard trees during brief severe low temperatures by building temporary shelters, covering them with cloth, and even supplying artificial heat from light bulbs, etc. While most citrus come true from seed, it may take some years before most seed-grown citrus reach flowering and fruiting age. Scions (twigs) cut from older trees are frequently grafted onto various rootstocks, often onto Trifoliate Orange. This is to hasten fruit production, improve cold hardiness, and adaptability to some soil conditions. Grafted trees are naturally more expensive. Challenges other than climate include insect and disease pests. Most of these can be avoided or managed by vigilant gardeners but they have greatly restricted interstate movement of citrus plants especially for those states with commercial citrus industries. The recent outbreak in Florida of a citrus disease called “Citrus Greening” has resulted in several statewide quarantines and stringent restrictions or prohibitions of interstate movement of citrus plants. Two nurseries offering a variety of hardy citrus and currently outside the quarantine zone are McKenzie Farms www.mckenzie-farms.com in Scranton, South Carolina, and Woodlanders, Inc. www.woodlanders.net in Aiken, South Carolina. In any area where citrus is not the norm a citrus tree with fragrant flowers or showy fruit will be sure to attract attention and reward the grower.